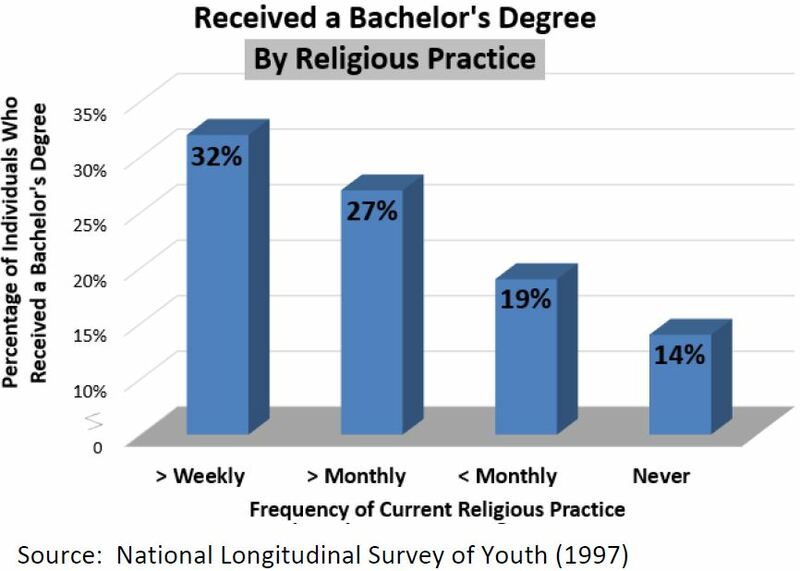 Considerable research has emerged over the past five decades that demonstrates the benefits of religious practice for society. Religious practice promotes the well-being of individuals, families, and the community. Regular attendance at religious services is linked to healthy, stable family life, strong marriages, and well-behaved children. Religious worship also leads to a reduction in the incidence of domestic abuse, crime, substance abuse, and addiction. In addition, religious practice can increase physical and mental health, longevity, and education attainment. These effects are intergenerational, as grandparents and parents pass on the benefits to the next generations. The practice of religion is a powerful antidote to many of our nation's pressing social ills, many of which have reached historically high proportions. Yet, despite the societal benefits of religion, the expression of faith in the public square has faced many challenges. 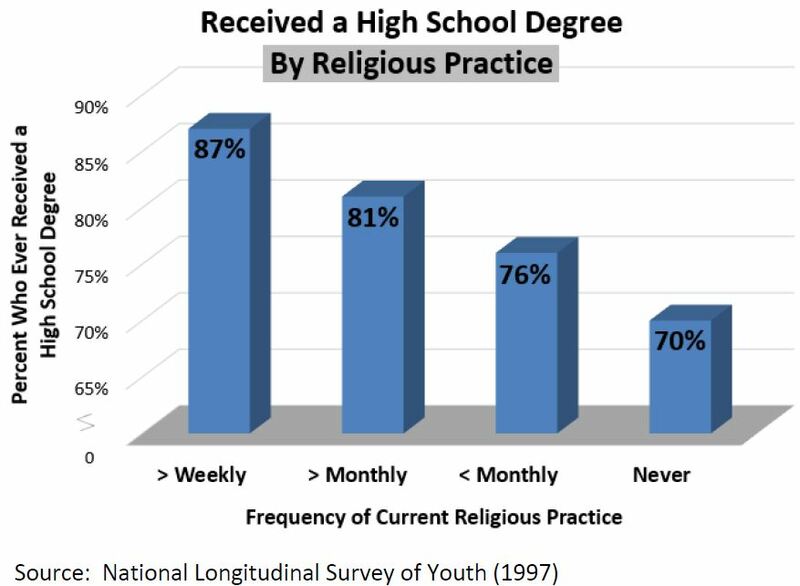 Social science research indicates that permitting and accommodating free religious practice is necessary to move society in positive directions. The practice of religion not only stabilizes marriage, but also improves its quality. Brad Wilcox of the University of Virginia found that the more frequently husbands attended religious services, the happier their wives said they were with the level of affection and understanding that they received and the amount of time that their husbands spent with them.26) Similarly, religious participation tends to foster an authoritative, warm, active, and expressive style of parenting. Parents who attend religious services are more likely to enjoy a better relationship with their children27) and are more likely to be involved with their children's education.28) Moreover, the greater a child's religious involvement, the more likely both the child and parent will agree about the quality of their relationship,29) the more similar their values will be, and the greater their emotional closeness will be.30) However, some of the same research also shows that religious differences within families can detract from the parent-child relationship. 1) James D. Richardson, Compilation of Messages and Papers of the Presidents, 1789-1897 (Washington, D.C.: U.S. Government Printing Office, 1907), Vol. 1, p. 213. 2) , 6) Jennifer L. Glanville, David Sikkink, and Edwin I. Hernandez, “Religious Involvement and Educational Outcomes: The Role of Social Capital and Extracurricular Participation,” The Sociological Quarterly 49, no. 1 (2008): 105-137. 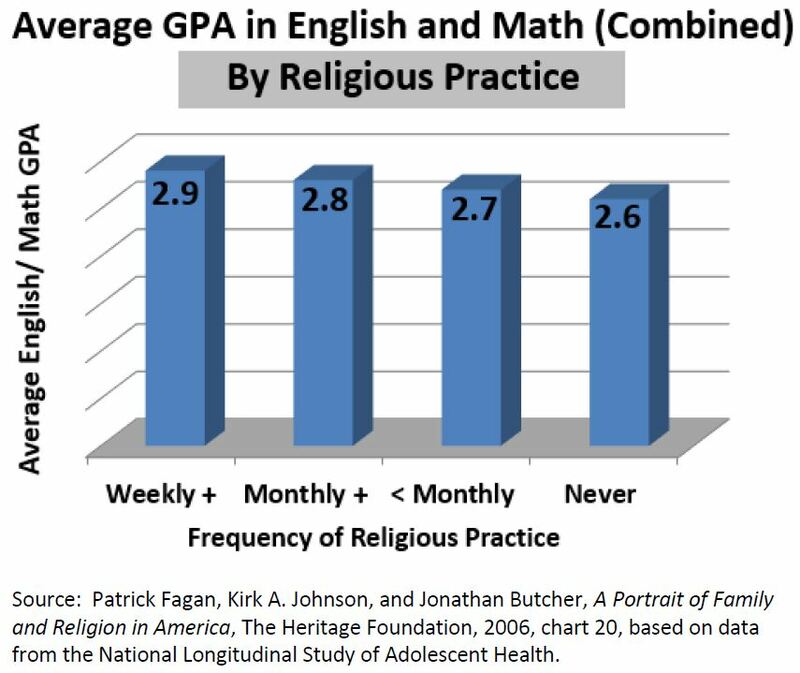 3) , 16) Mark D. Regnerus, “Making the Grade: The Influence of Religion upon the Academic Performance of Youth in Disadvantaged Communities,” University of Pennsylvania, Center for Research on Religion and Urban Civil Society Report No.3, 2001. 4) , 17) , 18) Mark D. Regnerus, “Shaping Schooling Success: Religious Socialization and Educational Outcomes in Metropolitan Public Schools,” Journal for the Scientific Study of Religion, Vol. 39, Issue 3 (September 2000), pp. 363-370. 5) Patrick Fagan, Kirk A. Johnson, and Jonathan Butcher, A Portrait of Family and Religion in America, The Heritage Foundation, 2006. 7) , 11) Chandra Muller and Christopher G. Ellison, “Religious Involvement, Social Capital, and Adolescents' Academic Progress: Evidence from the National Education Longitudinal Study of 1988,” Sociological Focus, Vol. 34, No. 2 (May 2001), pp. 155-183. 8) Patrick F. Fagan and Scott Talkington, “'Ever Received a High School Degree' by Structure of Family of Origin and by Current Religious Attendance,” Mapping America Project. Available at http://marri.us/wp-content/uploads/MA-99.pdf. 9) Patrick F. Fagan and Scott Talkington, “'Ever Received a Bachelor's Degree' by Current Religious Attendance and Structure of Family of Origin,” Mapping America Project. Available at http://marri.us/wp-content/uploads/MA-105.pdf. 10) Derek Neal, “What Have We Learned About the Benefits of Private Schooling?” Federal Reserve Bank of New York Economic Policy Review, Vol. 4, No. 1 (March 1998), pp. 79-86. 12) Richard B. Freeman, “Who Escapes? The Relation of Churchgoing and Other Background Factors to the Socioeconomic Performance of Black Male Youths from Inner-City Tracts,” National Bureau of Economic Research Working Paper No. 1656, June 1985. 13) Douglas M. Sloane and Raymond H. Potvin, “Religion and Delinquency: Cutting Through the Maze,” Social Forces, Vol. 65, No. 1 (September 1986), pp. 87-105. 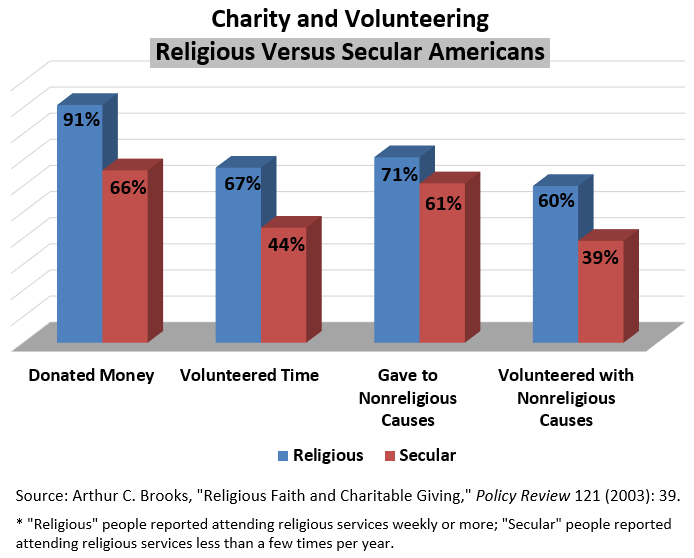 14) Archur C. Brooks, “Religious Faith and Charitable Giving,” Policy Review 121 (2003): 39. Available at http://www.hoover.org/research/religious-faith-and-charitable-giving. 15) Arthur C. Brooks, “Compassion, Religion, and Politics,” Public Interest (September 22, 2004): 57–66. 19) , 20) Byron R. Johnson, David B. Larson, Spencer De Li, and Sung Joon Jang, “Escaping from the Crime of Inner Cities: Church Attendance and Religious Salience Among Disadvantaged Youth,” Justice Quarterly 17, no. 2 (June 2000): 377-339. 21) John Gartner, David B. Larson, and George Allen, “Religious Commitment and Mental Health: A Review of the Empirical Literature,” Journal of Psychology and Theology 19, no. 1 (Spring 1991): 6–25. 22) Deborah Hasin, Jean Endicott, and Collins Lewis, “Alcohol and Drug Abuse in Patients with Affective Syndrome,” Comprehensive Psychiatry 26, no. 3 (May–June 1985): 283–295. 23) , 24) Byron R. Johnson, Ralph Brett Tompkins, and Derek Webb, “Objective Hope-Assessing the Effectiveness of Faith-Based Organizations: A Systematic Review of the Literature,” Manhattan Institute for Policy Research, Center for Research on Religion and Urban Civil Society, 2002, at crrucs_objective_hope.pdf (June 30, 2005). 25) Jeffrey S. Levin and Preston L. Schiller, “Is There a Religious Factor in Health?” Journal of Religion and Health, Vol. 26, No. 1 (March 1987), pp. 9-35. 26) W. Bradford Wilcox, Soft Patriarchs, New Men: How Christianity Shapes Fathers and Husbands (Chicago: University of Chicago Press, 2004), p. 186. 27) Lisa D. Pearce and William G. Axinn, “The Impact of Family Religious Life on the Quality of Mother-Child Relations,” American Sociological Review, Vol. 63, No. 6 (December 1998), pp. 810-828. 28) W. Bradford Wilcox, “Religion, Convention, and Paternal Involvement,” Journal of Marriage and Family, Vol. 64, No. 3 (August 2002), pp. 780-792. 29) William S. Aquilino, “Two Views of One Relationship: Comparing Parents' and Young Adult Children's Reports of the Quality of Intergenerational Relations,” Journal of Marriage and Family, Vol. 61, No. 4 (November 1999), pp. 858-870. 30) Lisa D. Pearce and Dana L. Haynie, “Intergenerational Religious Dynamics and Adolescent Delinquency,” Social Forces, Vol. 82, No. 4 (June 2004), pp. 1553-1572.